"Why would the Splicers rebuild Sepiks? They already have SIVA." "I can make a guess. Maybe an offer to the other Devils. You know — "In SIVA we trust" and "In SIVA, all things are possible." Get in there. And show them that their "god" is nothing more than metal and tech." Sepiks Perfected is the remastered variant of Sepiks Prime. It was previously thought to be dead, but since the House of Devils unearthed SIVA, it was brought back to life. The Fallen House of Devils once had firm control over the Cosmodrome of Old Russia, marking it their territory for years, until brave Guardians began to boldly push them back, taking out their leaders and engaging the Devils’ crews at every turn. This in turn began to weaken their control but despite continued success against Fallen leadership throughout the Cosmodrome, no victory delivered a more crushing blow to the Devils than the destruction of their God-Servitor, Sepiks Prime. However, with the House of Devils' discovery of SIVA in the Plaguelands, Sepiks has been reborn— Augmented and Perfected through SIVA and set to usher in the conversion of the House of Devils from desperate scavengers to SIVA-powered soldiers. 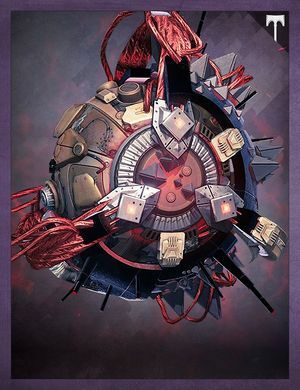 It was believed by Shiro-4 that the Devil Splicers brought back Sepiks to control the flow of ether, granting them complete control over the Devil House. The Guardians first encountered the "Perfected" Servitor when it was sent to lead the Devils into taking Felwinter Peak. Despite its heightened abilities, Sepiks was destroyed but it was only a temporary victory as, with its regenerative abilities, it returned and fled for the Cosmodrome. Shiro-4 recognized the danger Sepiks posed and so organized a Strike team to breach the Devil Splicers defenses and destroy the resurrected Prime Servitor. Fighting through Splicer and Hive to the Devil's Lair, the Guardians found Sepiks Perfected being tended to in the same hall from where it was destroyed three years ago. It faced off with the Guardians in a heated battle but despite its powers, Splicer reinforcement and extra shielding, Sepiks Perfected was destroyed, permanently. Sepiks Perfected is encountered twice in the Rise of Iron expansion. It is first encountered in the King of the Mountain Story Mission, where it can be seen leading an assault on Felwinter Peak to destroy the Iron Temple. Lord Saladin orders the Guardian to kill it fast or Felwinter Peak is officially taken over by the Devil Splicers. Upon reaching the top of the mountain, Sepiks Perfected will appear to launch an ambush. It attacks by firing bursts of five Solar Eye Blasts that have high velocity and a tracking ability. In addition, it can fly, levitate, and teleport around the area at will, and can always call upon reinforcements. If faced up close, it will launch a sustained beam that drains Guardians' shields in seconds. Your best bet will be to fight back from afar. When defeated, the mission ends, but Sepiks Perfected isn't officially dead. Sepiks Perfected makes its last stand at The Devils' Lair Strike. It will have all the aforementioned abilities and will behave like its predecessor, but this time around, it has new capabilities. For one, it plants down SIVA Nodes for area denial, some of which cannot be destroyed; if near one of these, you will be inflicted with the "SIVA Swarm" debuff. It will also be significantly more durable than before purely in terms of health count. However, the main mechanic is an elemental shield that can only be taken down using heavy artillery cannons dropped by certain Splicer Captains: Shock Captains for Arc, Splicer Scorch Captains for Solar, and Null Captains for Void, in that particular order. It will bring up these shields one after another when the previous one goes down. Beware that each cannon only has one round that can be fired. Once all three shields are brought down, it will become permanently vulnerable, allowing Guardians to unleash all their attacks on it, finally laying waste to Sepiks Perfected for good. During the battle against Sepiks Perfected when he puts up his shield, two Cannon Splicer Captains one is the default Splicer Captain and the other one is the normal Captain model but with Splicer colors. Strangly, when you kill the Captain, their model switches to the Splicer Captain model. Sepiks is one of four bosses with more than one encounter at the end of the Strike , the others being the Phogoth, Taniks, and Sekrion, Nexus Mind. Despite being left as an almost encased chassis after its first death, Sepiks Perfected appears with more than half of its encasing gone. This could be due to the transformation it had with SIVA. Sepiks Perfected in King of the Mountain. Sepiks Perfected in the Devils' Lair.